April 18, 2018 (Tony Cartalucci - NEO) - The Western media continues to saturate headlines with stories of "Russian meddling," meanwhile Western governments led by Washington openly celebrate their own meddling in foreign political affairs. One such example unfolded during the US State Department's annual "Women of Courage Awards" with Thailand-based Sirikan "June" Charoensiri among the recipients. In the immediate aftermath of Thailand’s May 2014 coup d’etat, lawyer Sirikan Charoensiri (known as June) co-founded Thai Lawyers for Human Rights (TLHR), a lawyers’ collective set up to provide pro bono legal services in human rights cases and to document human rights issues under the military government. TLHR has represented hundreds of clients since the military coup, often as the only alternative for those facing politically-motivated charges. Because of the political sensitivity of the organization’s work, TLHR lawyers and staffers, and June in particular, have been subjected regularly to harassment, intimidation, and criminal charges. 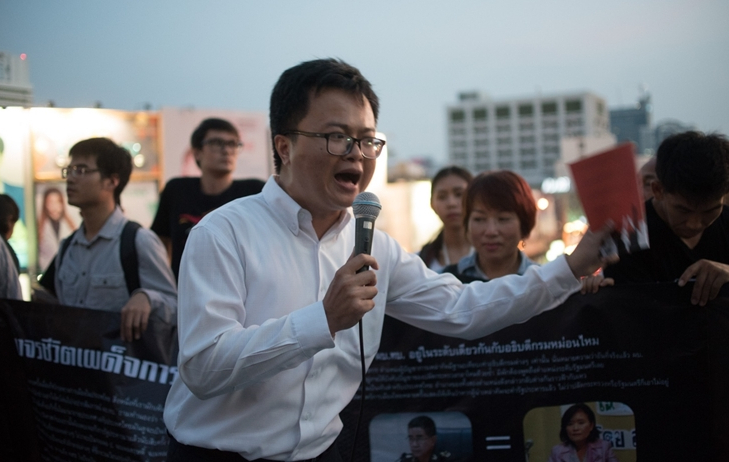 As a consequence of her advocacy, June is currently facing three sets of criminal charges for her work as a lawyer, including a charge of sedition – the first for a lawyer under the military government. Nevertheless, June continues undeterred in her work. However, completely omitted from Charoensiri's "biography" is the fact that her organization - Thai Lawyers for Human Rights (TLHR) - was organized out of the US Embassy in Bangkok following the 2014 coup and has since been funded by the US State Department via the National Endowment for Democracy (NED) since - aimed at US-backed regime change. 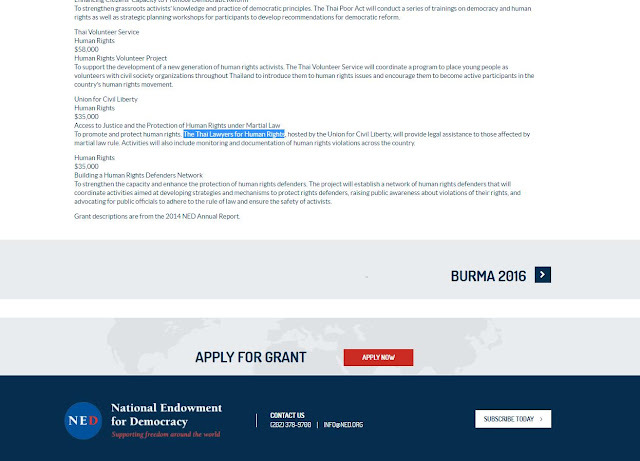 NED's website included TLHR under its 2014 recipients but has since erased this page. Its 2017 listings for Thailand omit TLHR's funding despite its continued sponsorship. Local English newspapers like The Nation have covered TLHR admitting they are funded by "foreign organizations" but failed to list them or press TLHR members regarding their dependence on foreign government funding and potential conflicts of interest. Established on May 24, 2014 and funded by foreign organisations, the centre has risen to prominence fast. Its rise to "prominence" is owed to the almost constant promotion afforded to it by the Western media - particularly representatives of Western media corporations like Reuters, AFP, the BBC, and others based in Bangkok, Thailand. Defending Human Rights? Or US-Funded Regime Change? The US State Department's aggrandizement of Charoensiri is aimed at lending what is essentially US political meddling in Thailand's internal affairs a sense of badly needed legitimacy. Despite the implications inferred by the award ceremony and a constant barrage of stories claiming TLHR is fighting for "human rights" in Thailand, the clients these "lawyers" represent are exclusively agitators attempting to oppose and overthrow not only the current Thai government, but Thailand's military and constitutional monarchy. These goals directly serve those of US-backed political proxy, billionaire Thaksin Shinawatra. A former Carlyle Group adviser, personal friend of the Bush family, and since the 2006 coup that ousted him from power - recipient of lobbying efforts from the largest PR firms in Washington - Shinawatra represents US ambitions towards establishing Thailand as a client state aimed at opposing China's regional and global rise. Many of those being represented by TLHR are literally members of Thaksin Shinawatra's street front, the United Front for Democracy Against Dictatorship (UDD) also known as "red shirts." Protesters taking to the streets in recent weeks even literally wear their signature red shirts to demonstrations. The Western media has intentionally omitted mention of who the protesters are, what they represent, and who is funding them - just as they have attempted to conceal the source of TLHR's funding. Anon Nampa is a human rights lawyer who works with Thai Lawyers for Human Rights (TLHR). The leaders are Rangsiman Rome, Sirawith Seritiwat, Nattha Mahatthana, Anon Nampa, Sukrit Piansuwan, Chonticha Jaengrew, Karn Phongpraphan, Netiwit Chotipatpaisal and Ekachai Hongkangwan. Nampa can also be clearly seen on stage during protests alongside protest co-leaders. In essence, a US government-funded organization is not only defending members of an anti-government protest in a foreign nation, it is also providing leadership and resources to the protest itself. In essence, a US government-funded organization is not only defending members of an anti-government protest in a foreign nation, it is also providing leadership and resources to the protest itself. Other "leaders" of the protest, including Chonticha Jaengrew are in regular contact with US Embassy staff, have visited the embassy and embassy-organized events but have so far attempted to deny any ties to US government funding or directives. Nampa's US-funding and his role in leading protests - however - implicates fellow protest leaders in aiding and abetting foreign-funded subversion. Since 2006, US political proxy Thaksin Shinawatra - a convicted criminal and fugitive hiding abroad - has attempted to hold power through a series of nepotist-appointed proxies including his brother-in-law Somchai Wongsawat and his sister Yingluck Shinawatra. Shinawatra's sister was ousted from power in the above-mentioned 2014 coup. More recently, he has also invested in multiple alternative opposition fronts and parties in an attempt to re-brand his increasingly embattled political machine. Opposition to the 2014 coup has since been depicted by the Western media as a "pro-democracy" movement rather than pro-Shinawatra despite protests being led by overt lobbyists and political organizers working for Shinawatra and his US sponsors. The protests themselves are openly attended by Shinawatra's street front, the United Front for Democracy Against Dictatorship (UDD) also known as "red shirts" who can be clearly seen wearing their signature red color during recent events. Shinawatra's UDD has taken to the streets before. In 2009 during riots, UDD red shirts murdered two shopkeepers while attempting to loot their property. 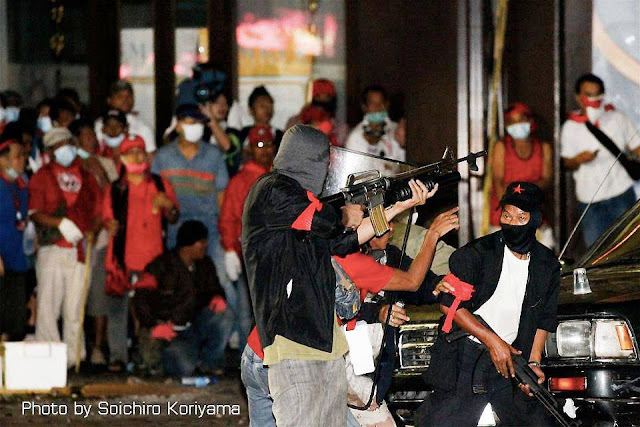 In 2010, Shinawatra would augment his red shirt mobs with heavily armed militants triggering weeks of gun battles with government troops in the streets of the capital, resulting in nearly 100 deaths. In 2014 amid growing protesters against Shinawatra's sister, Yingluck Shinawatra, her corruption, and her overt attempts to amend Thai law to return her brother to power - these same militants using assault rifles and grenades attacked protesters in a bid to push them off the streets. The escalating violence was in fact what finally precipitated the 2014 coup. Threats by Shinawatra, his political party and his UDD "red shirt" street front of eventual "civil war" if his return to power remains obstructed have triggered fears of US-backed Syrian-style violence. While it is unlikely Shinawatra and his US sponsors can replicate the scale of violence unfolding in Syria, they could easily sponsor a campaign of terrorism the Western media would eagerly depict as "civil war." 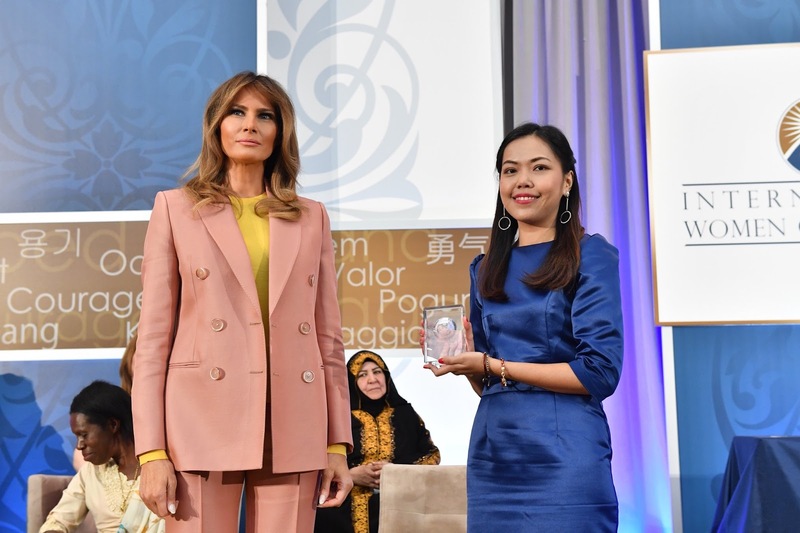 The US State Department's funding and aggrandizement of agitators like Charoensiri and her "Thai Lawyers for Human Rights" illustrates how US "soft power" is used to set the stage for protests and eventually violence aimed at "hard" regime change. Becoming familiar with the names, financial, political, and logistical ties of supposed "opposition" working on behalf of Washington today helps genuine journalists and analysts get ahead of the curve and impeding tomorrow's attempts by Washington to stampede a targeted government out of power and replace it with a client regime of its own choosing - and all the violence, instability, death, and misery that will surely accompany it.